Kittiwake facts – Free Science Activity Sheet For Kids. Our Free Printable science worksheets for parents are fun online word search puzzles, which can be downloaded and printed. Help your kids discover some interesting fun facts about the kittiwakes with our free science activity sheet about the Kittiwake bird. 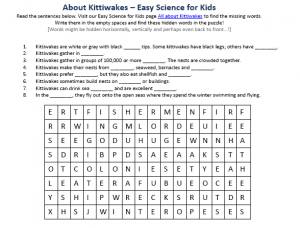 This free printable word puzzle game on Kittiwakes can help your children learn about these sea birds, and know the difference between a black-legged Kittiwake and a red-legged Kittiwakes free science activity sheet for kids. It is also interesting to know how the Kittiwake build their nest and where is it built! Find out more info about the Kittiwakes here.